Finding myself suddenly without New Years plans due to recent life altering chaos, one of my bestest friends in the world - Vino - decided to lift my spirits by being my date on New Years. Vino and I have been friends since we were forced to sell pumpkin grams together in 6th grade. We couldn't have been more different, and I actually thought she was the most annoying person I'd met at the time. BUT, life is funny, and despite how different were were - she was outgoing, athletic, and loud; I was painfully shy, quiet, and consistently almost flunked gym class - we became fast friends. We've been there for each other through thick and thin, and since 2009 was a pretty awful year for the both of us, we decided to ring in the new year together, in hopes of starting things off on a good note. We made our New Years dinner plans sort of last minute, so we had slim pickin's for reservations. I wasn't quite in the mood to eat dinner at 5:00 pm or midnight at one of the "better" restaurants in town, so we decided to have dinner at 8:30 at Mad Greek in Cleveland Heights. Neither one of us had ever been there, but the idea of a restaurant serving both Indian and Mediterranean food seemed like an interesting place to check out. After almost breaking our necks walking to the door (note to self: single girls must be more skilled at wearing high heels - practice when there hasn't been an ice storm), we found Mad Greek to be really empty. Sort of a bad sign on the busiest dining out night of the year. But that didn't discourage us. Not everyone like ethnic food...maybe it was too early for the place to be crowded...we still had high hopes for a good meal. I started off my mainly sober New Years with a Santorini Sunset, a mix of tropical flavored liquor, including my absolute favorite - midori. 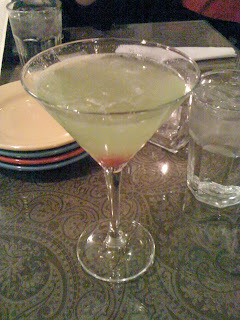 You can't really go wrong with a tropical martini, now can you? Unfortunately, the meal went downhill from there. We decided to get a dip sampler as an appetizer. 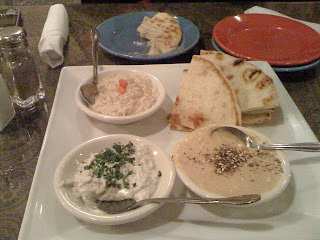 It came with hummus, tzatziki - a yogurt sauce, which in this case was dill flavored, baba ghanouj, and pita bread. All things that I generally like. Since this was a Mediterranean/Middle Eastern kind of place, I expected to get the best hummus of my life. Sadly, this was not so. If you eat hummus as much as I do, you know it isn't supposed to be runny. And it's supposed to have some flavor. I think I was only able to stomach one spoonful. What a disappointment. As most restaurants do on New Years, Mad Greek had a "special" menu for the evening, which had one vegetarian option. (unlike the regular menu which has plenty of vegetarian options) We decided to ask our waitress if the kitchen could make one of the "meat" dishes meatless for us. They weren't able to, but they did whip up the Athenian Pasta, a dish served on the regular menu. Again, it sounded like it could be an amazing entree - penne pasta with spinach, artichoke hearts, red pepper, onion, mushrooms, and feta cheese. 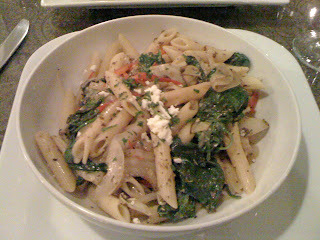 In my mind, I thought it would be similar to the Mediterranean Pasta at Brio, which is always good. Not so. The olives and artichokes clearly came out of a can. There was a weird spice/seasoning mix dumped on the top of the pasta that made it difficult to eat because it just tasted so bad. Neither of us really made a dent in our entrees because they were so awful. Overall, it was a really disappointing meal. But thankfully, our dinner was the worst part of the evening. Vino and I got a chance to talk about all of the awful things that happened to us this past year our plans for the future. Later in the evening, we met up with some other friends at Il Bacio in Little Italy (despite how expensive it is, we should have eaten dinner there) and rang in my first single year in 10 years watching Univision. (random, right?) I closed out the night at Bodega in Coventry. Being probably the only sober person in the bar at 2 am made for some great people watching. But all in all, it was a great way to start off this new, hopefully less drama-filled year. being 100% greek i think it's a shame that i've never been there - i really need to make an effort to head out to the east side more.